For years, my boss has reminded us we don’t always have to create a better solution. We can just steal it– I mean borrow it–from our peers and bend or shape it to best fit our situation or application. I bet many of you have done this and you chances are you may not have been working at the time. Have you ever taken photos of interesting parking or mobility-related infrastructure, signage, or any other cool transportation solutions you have seen while traveling for work or on vacation? I know I have. My friends and family make fun of me and roll their eyes each time something parking related catches my attention. Lucky for me, they tolerate my actions and are patient and understanding enough to wait for me at the end of the block so I can catch up! I have found they are even my champions on occasion and send me cool transportation-related photos from their own travels. Now, that’s a great support network! Recently, an associate vice president at our university not only admitted she does this, too, but also proudly sent evidence from one of her last great finds. 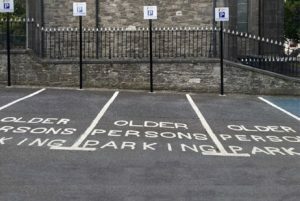 While on a trip to Ireland, she happened upon “Older Person Parking,” and snapped a photo to share with us. No joke! Although this may not be a solution we work to implement anytime soon, it does reinforce the longtime worry that parking should be on the highly infectious disease list–people just catch the bug! So, fellow parking industry specialists, be proud and keep those cameras flashing. Then, take it one step further and mold that idea that caught your attention into the next best thing within your own organization. Debbie Hoffmann, MS, CAPP, is director of transportation services at Texas A&M University.